Do you like stories about the wild west? Do you like centaurs? Then have I got the webcomic for you! 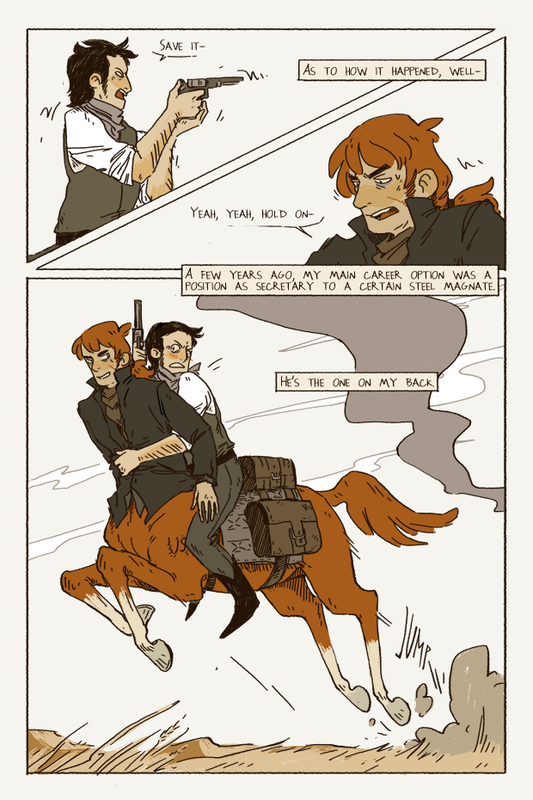 Recently, a single page of a comic randomly showed up on my Tumblr feed. Intrigued, I followed the link and discovered the world of Hotblood. 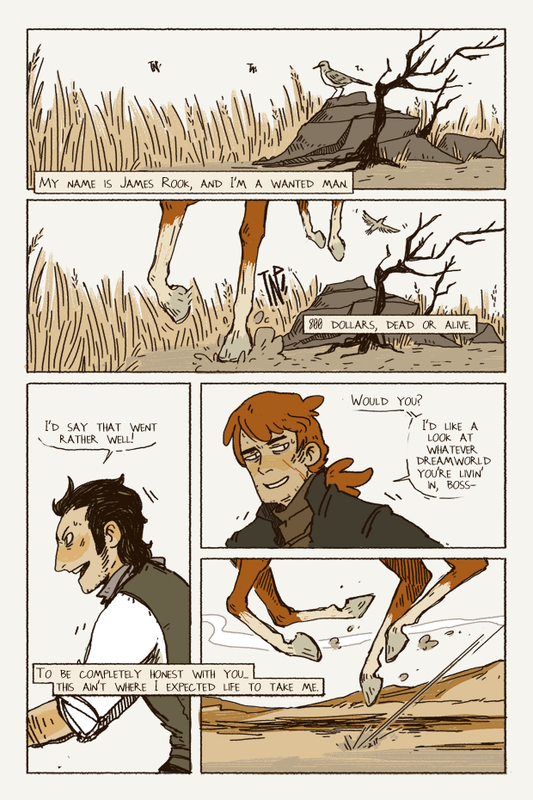 The brainchild of an artist named Toril Orlesky, Hotblood follows the adventures of James Rook, a centaur still smarting after the Civil War and his new boss, the wiley Asa Langley. Asa owns a series of steel mines in the unforgiving wild west and things are poised to hit the fan very soon. The year is 1871 and Asa is about to do something stupid. First of all, the artwork is lovely. It's imperfect and evocative rather than comic book perfect. The colors and shading are great and give off that patented sepia feel. The world Orlesky has created is not so different from our own, apart from the centaurs. In this alternative world, they're just as common place as regular people. They wear clothing and hold jobs. Rook makes more of a scene being drunk than he does having four legs. They aren't unusual at all and that is really cool. The story is a slow burn. Rook is sent to be Asa's secretary. Asa doesn't want him. Hijinks ensue. They soon begin to begrudgingly respect each other. There are big payoffs promised to those who follow along. I'm usually bad at following webcomics. If it isn't in my usual social media streams, I forget about it and check back every few months (I am so behind on Questionable Content...). Hotblood is hosted entirely on Tumblr, making it incredibly easy to follow along. Why aren't all webcomics hosted on Tumblr? Time to get in on the ground floor with this one, folks! It's going to be AWESOME! Nice and lovely blogging. Very infomative article. I would like to share something related to gaming. While I was looking for a gaming website over Internet I came across a website which offer free access to playstation gaming. It very interesting as it has free codes to deliver from playstation to make gaming more interesting. Visit free psn codes and get access to all offers from playstation for free. And also get access to all games offered from playstation for free. Visit playstation plus code generator use this generator to generate free codes from psn and use these codes to make gaming experience over playstation more exciting and interesting. Visit to know more about online availability of live games over playstation.